The ceremonies and religious customs of the various nations of the known world was the first book to compare the world’s religions in a way that encouraged tolerance and has recently been called 'The book that changed Europe'. 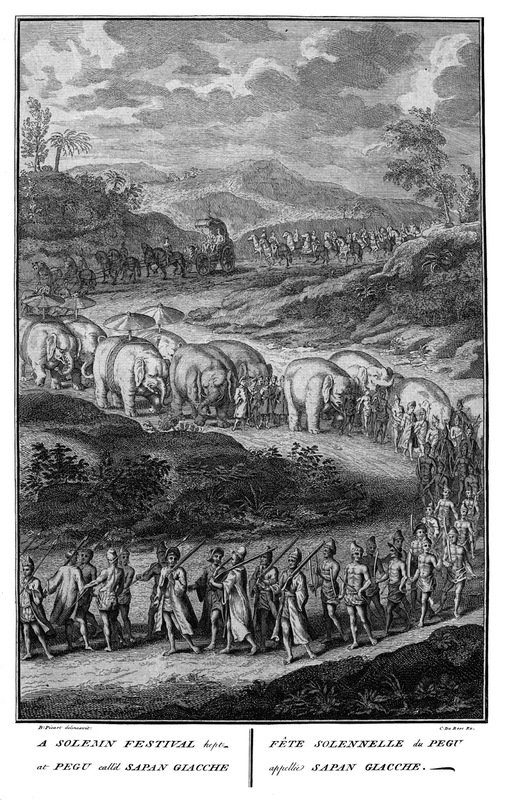 The ceremonies and religious customs was illustrated by Bernard Picart and written and published in Amsterdam by Jean Frederic Bernard between 1723 and 1737. 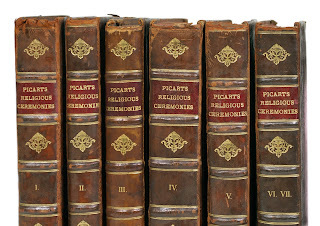 Better known as Picart’s Ceremonies it is a beautifully illustrated seven volume work with over 260 plates of engravings by Picart who was one of the most famous engravers and book-illustrators of the time. Much of the text that accompanies these images was written by Jean Frederic Bernard, a successful book publisher, although his name never appeared on any of the editions. What made this such a revolutionary work was that Bernard & Picart try to present as positive a version of other beliefs to the European readers. To achieve this they focus on ritual rather than discussions of doctrine. The illustrations depict events familiar to all humanity, rituals for births, deaths, marriages and processions. Ref: Religious ceremonies and customs..., v.4, p.38, Jean Bernard & Bernard Picart, 1731, Sir George Grey Special Collections, Auckland Libraries, 1731 RELI. It is significant that both Bernard & Picart were Protestant refugees who had left France for the more tolerant society of Holland. 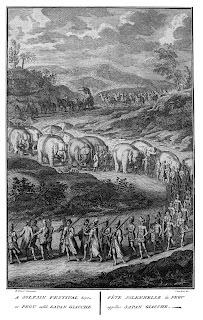 In The book that changed Europe, Hunt et al make the point that Picart’s Ceremonies cannot be understood apart from Bernard and Picart’s own experience of religious intolerance and persecution. 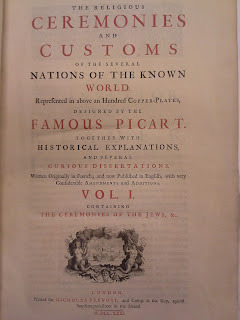 Even though Picart’s Ceremonies was a blockbuster upon publication and helped make Bernard a wealthy man it was placed on the Index of Forbidden Books in 1738. Hunt et al place such importance on the book that they name Bernard as one of the founders of the Enlightenment. It is sad that belief that inspired Picart’s Ceremonies remains relevant today, as it appears that promotion of religious tolerance is just as necessary as it was almost 300 years ago. Auckland Libraries has not one, but two copies of the English translation of this landmark 7 volume publication. 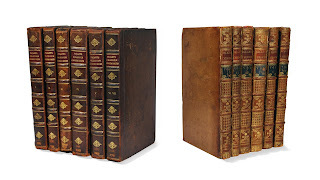 The English translation appeared in instalments from 1731-1739 with differing titles and imprints. 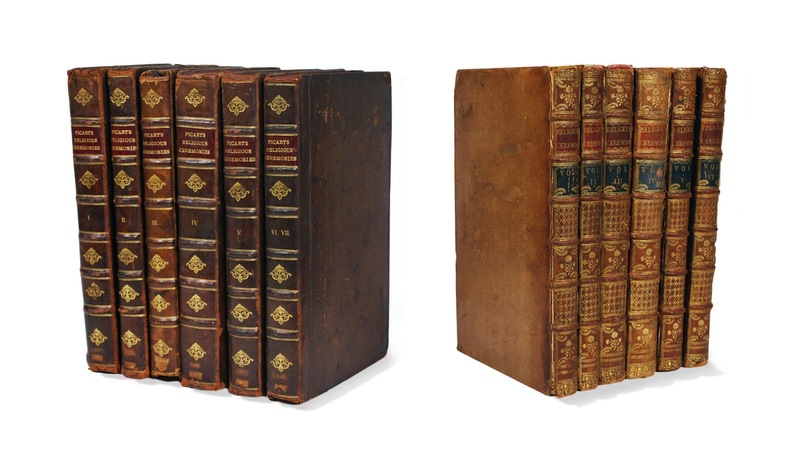 Like the editions in other languages volumes 6-7, covering Protestantism and Islam respectively, are bound together. Ref: The ceremonies and religious customs of the various nations of the known world, Jean Bernard & Bernard Picart, 1733-1739, Sir George Grey Special Collections, Auckland Libraries, 1733 CERE. This can be seen when comparing the two copies in the library, throughout the volumes engravings are on different pages and placed next to different parts of text. Ref: Religious ceremonies and customs..., v.1, Title page, Jean Bernard & Bernard Picart, 1731, Sir George Grey Special Collections, Auckland Libraries, 1731 RELI. When you consider that only 800 copies were printed it was it is rather amazing that 2 copies have ended up in Auckland Libraries almost three centuries later. Ref: Ceremonies..., Jean Bernard & Bernard Picart, 1731-1739, Sir George Grey Special Collections, Auckland Libraries, 1731 RELI & 1733 CERE. Like most of the rare books here it is down to the generosity of donors, in this case Henry Shaw and Norman Spencer. Henry Shaw’s contribution to Auckland Libraries has been well documented elsewhere, and we’ve previously explored some of the treasures Henry Shaw donated to the library. The second copy was donated by Norman B. Spencer CBE, an Auckland lawyer who was also the founder of the Passenger Transport Company and a President of the Auckland Chamber of Commerce. Norman Spencer’s philanthropy is well known; an essay prize, a street in Papatoetoe, and a hall of residence at Auckland University have all been named after him. He donated funds for 2 clocks for the tower at the Remuera Post Office, after which Mayor Dove-Myer Robinson thanked him for his ‘timely’ gift. At Auckland University he funded a hostel, at the Auckland Art Gallery he donated their first Venetian painting among others. 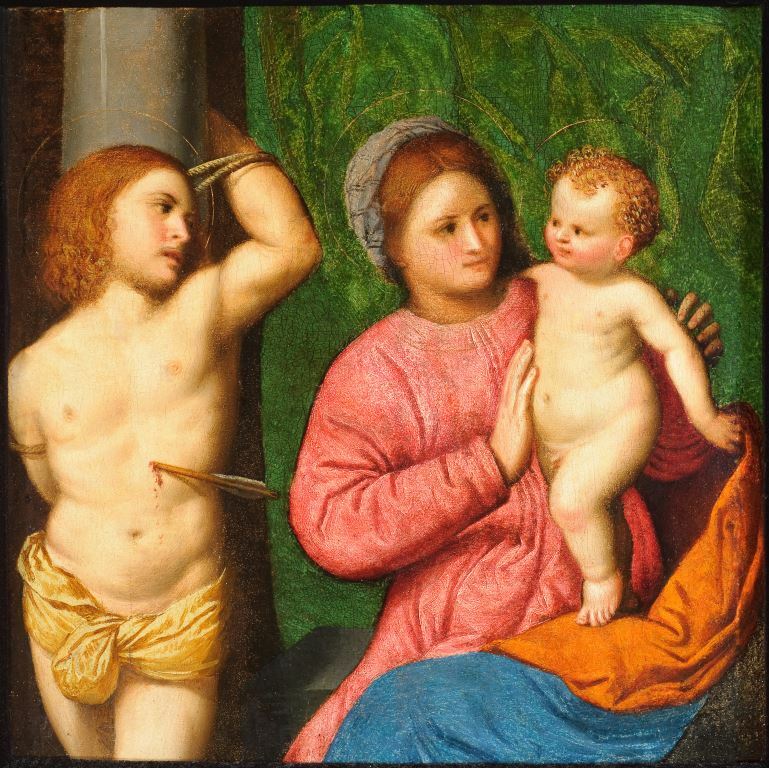 Ref: Paris Bordone, Madonna and Child with Saint Sebastian, c1518, Auckland Art Gallery. Auckland’s Freemasons Centre named their library the Norman B. Spencer Memorial Library in recognition of his significant donations there as well. 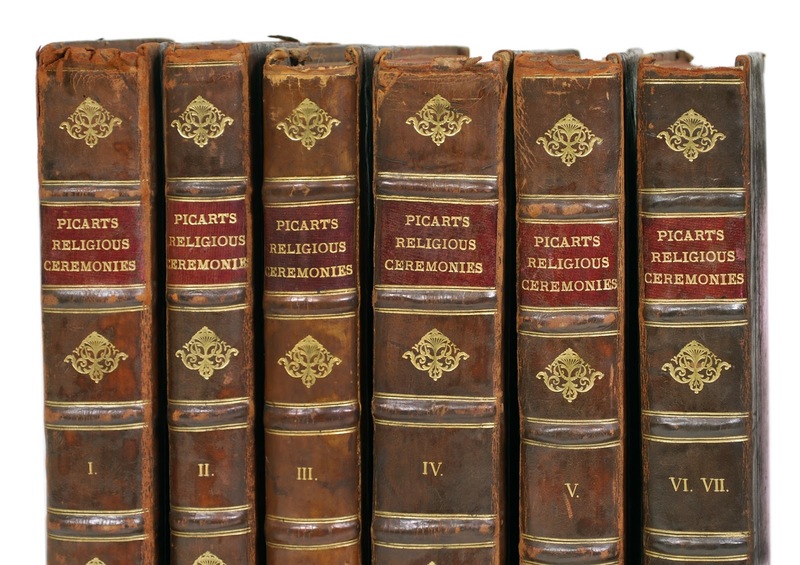 There is a note on the inside cover of the first volume of Picart’s Ceremonies that Mr Spencer donated to the library giving the page number of the engraving of the Freemasons. Given he was a high ranking Mason who was interested in the history of Freemasonry it can be assumed that this was the reason for his purchase of this book. Less attention has been given to his gifts to Auckland Libraries. Upon his death in 1968 he donated 77 volumes to the library including Picart’s Ceremonies, as well as early editions of Milton, Keats and Tennyson. The Spencer family continues this philanthropy with other recent donations. Thanks to these generous Aucklanders 2 copies of Picart’s Ceremonies are available for the public to enjoy at Auckland Libraries. So come into the Sir George Grey Special Collections reading room and have a look at the book that changed Europe and compare the two copies. If you’re interested in finding out more from home, use the library catalogue to search for ‘Bernard Picart’ and then click on the articles tab. The UCLA Digital Library has first editions in Dutch, French, English and German available so you can read Bernard’s text and see each of Picart’s engravings there.